Intel unveiled 10 new desktop and mobile CPUs today that feature the new Iris Pro graphics on a desktop processor for the first time. The flagship desktop processor will be the i7-5775C, which will be unlocked and loaded with Iris Pro Graphics 6200. 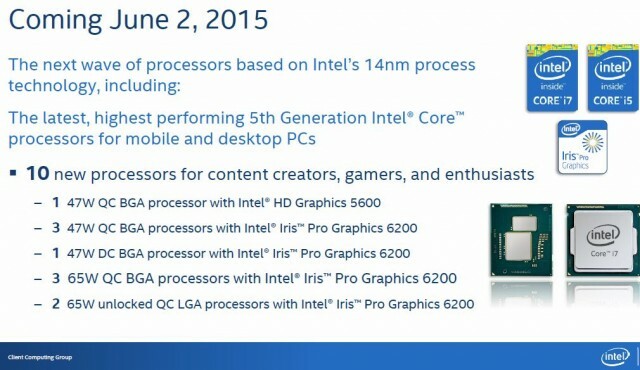 A full array of mobile and Xeon processor were also announced. Here is the news release/fact sheet we were sent today. 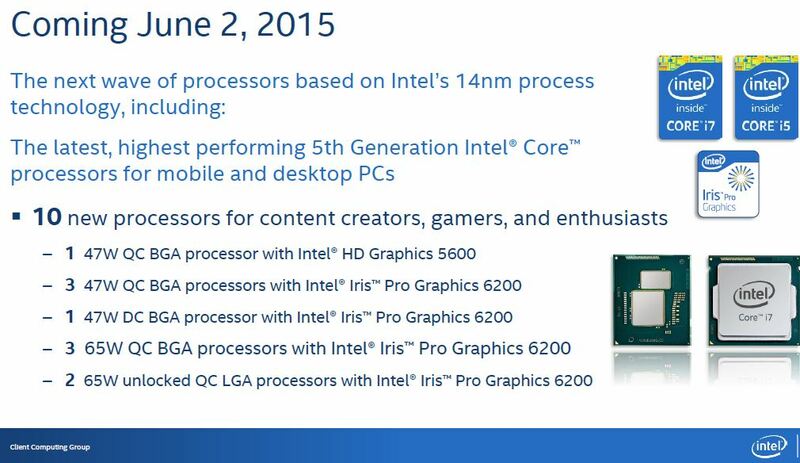 June 2, 2015 — Intel Corporation today announced it has augmented its 5th generation Intel® Core™ processor family. The company unveiled 10 desktop and mobile processors that boast new levels of performance, including Intel® Iris™ Pro graphics on an Intel desktop processor in the LGA form factor for the first time. The flagship desktop processor, Intel® Core™ i7-5775-C, delivers up to 35 percent better media performance1 and over 2x better graphics performance2 than the previous 4th gen 65-watt Intel® Core™ i7-4790S with Intel® HD graphics 4600 desktop processor. 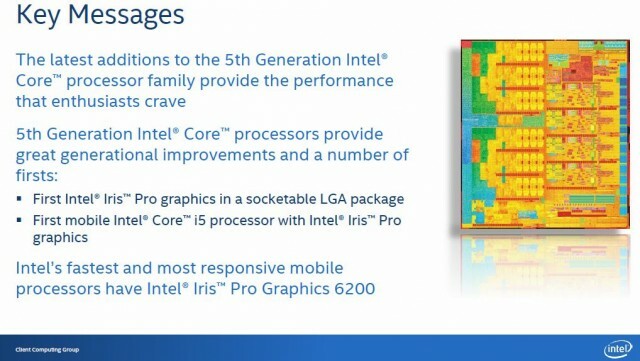 The increase in graphics performance is due to Intel Iris Pro Graphics 6200: Intel’s most powerful client processor graphics and media engine. A lower-power, 65-watt thermal design point (TDP) enables full PC performance in a broad range of desktop form factors, including smaller and thinner Mini PCs and desktop all-in-ones (AIOs). Five new desktop SKUs were announced. Five new 47-watt mobile 5th gen Intel Core processors deliver great performance for gamers and creators on the go. The Intel® Core™ i7-5950HQ processor offers up to 95 percent better media performance3 and up to 2x 3-D graphics performance4 compared to the current generation 15-watt TDP 5th gen Intel® Core™ i7 5600U mobile processor. 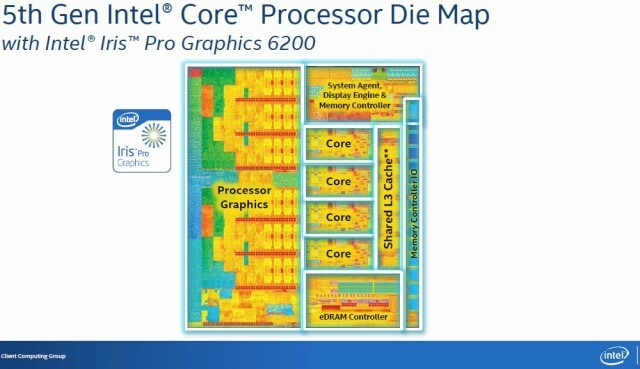 These new processors round out the performance segment of the 5th gen Intel Core processor family, code-named Broadwell. System availability is expected in the next 30-60 days. Intel also introduced the Intel® Xeon® processor E3-1200 v4 product family, now with integrated Intel® Iris™ Pro graphics P6300, Intel’s most powerful data center graphics. Featuring the latest generation Intel Xeon processor and built on 14nm process technology, the product family delivers up to 1.4x more performance for video transcoding and up to 1.8x more 3-D graphics performance compared to the prior generation. Companies providing video delivery require video transcoding solutions with cost-efficient, dense designs and optimized performance to support real-time, multi-stream delivery of high-definition (HD) video. The Intel Xeon processor E3-1200 v4 family features integrated Intel Iris Pro graphics P6300 and Intel® Quick Sync Video for hardware-accelerated transcoding performance – delivering up to 4,300 simultaneous HD video streams per server rack to provide high-quality content on demand to more users. 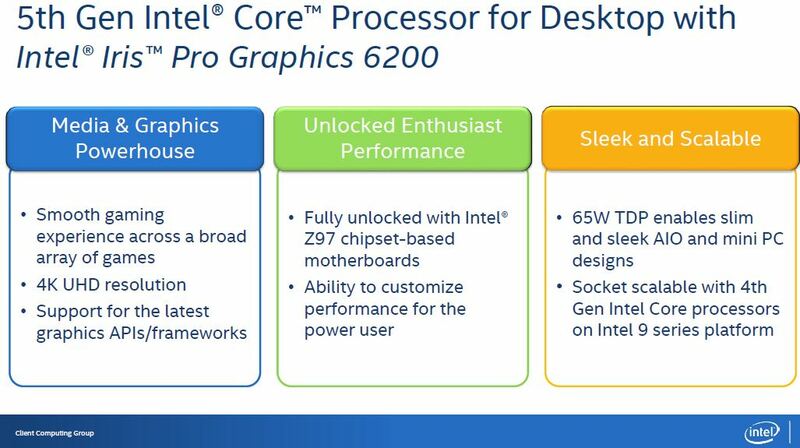 Most of our readers will be interested in the five new desktop CPUs, which are outlined below. All of these processors will work on a Z97 Socket 1150 based motherboard as long as the manufacturer has provided the appropriate BIOS update. 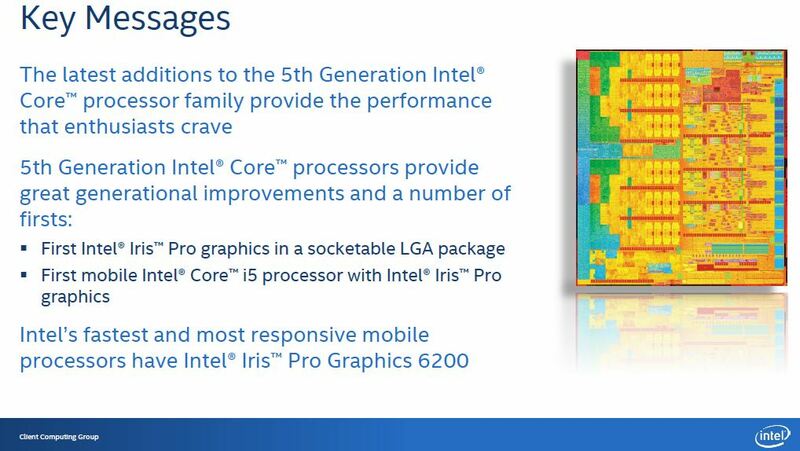 Intel also provided us with a few slides that highlight some of the benefits the new CPUs provide. Overclockers.com is on the list to receive a review sample, so stay tuned for that in the coming weeks! I'm not seeing any real gains for enthusiast class. While the reduction of power is nice, it looks like the 4790K will still "rule the roost" until Skylake. at least this lets me know to buy a 4790k now. I have to agree. I was holding off to see what was next and I don't see much reason to wait any longer. I do like that Intel stuck with the same socket though.